The VacIon Plus family includes Diode, Noble Diode, and StarCell® pump versions. It also includes MiniVac, Dual, and MidiVac Ion Pump controllers, to provide a selection of power levels and interfaces. An ion-sublimation combination pump is a well-known choice for creating an ultra-high vacuum environment in certain applications. The titanium sublimation module creates extra-high pumping speed for getterable gases, while the ion-pumping mechanisms handle the non-getterable gases, such as argon and methane. This combination pump is a VacIon Plus 150, 300, or 500 with an extra side- or bottom-mounted 8-inch ConFlat® Flange port. The sublimation cryopanel containing a titanium filament source is mounted on the extra port. The Varian VacIon Plus series pumps allow the addition of a cryopanel on the bottom of the pump or on the side. This flexibility can be a significant advantage in situations where height restrictions are present. Contact us for customized pump configurations. Varian offers a wide variety of small size ion pumps designed especially for electron device and detector applications. 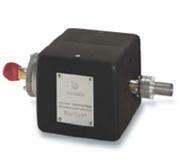 The Miniature VacIon pump is a diode configuration and provides approximately 0.4 l/s of nitrogen pumping speed. The 2 l/s model is a modified diode configuration to enhance starting at low pressure. The 8 l/s pump is a diode configuration with high efficiency for residual gases such as hydrogen. Modified versions of standard pumps can be provided when different inlet tube lengths, angles, and diameters are required. These pumps can also be customized with different high-voltage feedthroughs, body geometries, and pumping cell arrangements. Special testing procedures can be quoted for customers who have specific requirements in this area. Titanium Sublimation Pumps (TSPs) are typically used as an effective way to pump getterable gases such as hydrogen and nitrogen in UHV systems. TSPs are often combined with ion pumping, since the ion pump is effective with non-getterable UHV gases such as argon and methane. The TSP can be added to the inside of the ion pump or as a separate pumping unit. If the TSP is used in conjunction with a liquid-nitrogen cooled cryopanel, extra-high water-vapor pumping speed will be achieved. Filament-type TSP sources are best used in UHV systems, since they can be turned off between sublimations, and thus do not add thermally-induced outgassing. The ball-type sources contain larger amounts of titanium, which means longer life when operating under conditions that use more titanium, such as where operating pressures are higher. However, the ball sources require standby power between sublimations to prevent cracks from forming in the titanium ball.